Tasheema Felder founded Denim Bandit Workshop in 2017 after taking cues from her followers on social media who were intrigued by her customized denim looks and content. She then realized a void with people wanting to execute design ideas but lacking resources and a starting point. For centuries, denim has been one of the most substantial and versatile fabrics used in our everyday lives. No matter what trends come and go, denim remains a stable and a compelling form of expression. Denim Bandit Workshop was crafted with that same heritage in mind. We are an experimental design haven focusing on the up-cycling of denim. Our mission is to foster a platform with access to resources, tools and materials for emerging Artist, Designers and Creatives. Through this initiative we want to preserve unwanted garments by giving them new life and challenge the metrics of design with denim as the base. The process of up-cycling is not only sustainable and eco-friendly but gets the creative juices flowing for innovators and DIY project lovers. 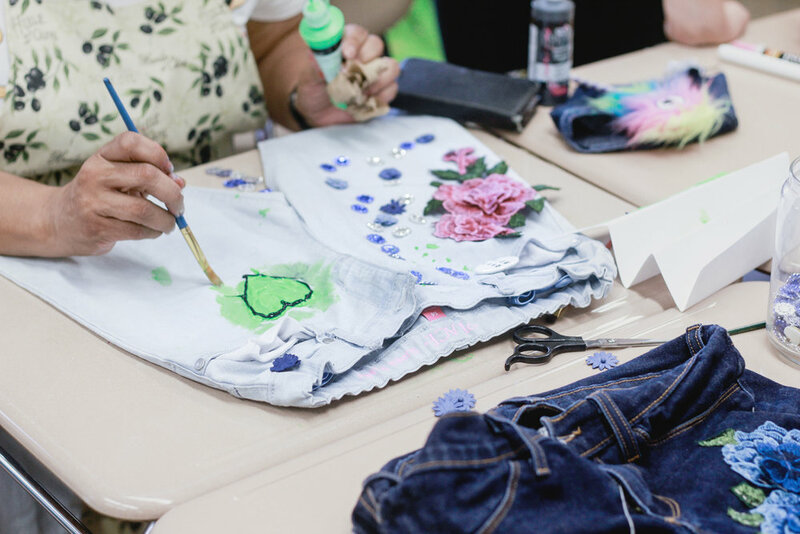 Denim Bandit Workshop is suitable for ages 3+ and family friendly. We provide the tools, you bring the creativity!